Area 920 Sq. Ft. - 2030 Sq. Ft.
Shire Heights is the latest apartment project of Shire Homes that touches the skies of the historic city of Kottayam, which is renowned for achieving 100% literacy. 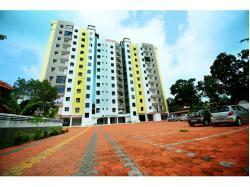 Even nestled in Kottayam Town, a posh residential area in the heart of the city, it is unfazed by pollution. Another advantage is that it has close proximity to all urban luxuries, may it be shopping malls, health clubs, premier schools and professional colleges, worship places of all major religions or hospitals including the Kottayam Medical College. Apart from that, there are plenty of natural scenic beauties as it is “The Gateway of Kumarakom”. 32.2 Lac	3500 per Sq. Ft. Interested in Shire Heights ?